I'm a pretty massive advocate for wearing sun protection whenever you're going to be leaving the house, really, but when you're going to be spending the day outside it's doubly important. Protecting your skin is important for your immediate comfort - I've never met anyone who actually enjoys a sunburn - as well as for the appearance of your skin, since sun damage is incredibly hard to reverse and can prematurely age you. But the more important thing is that it's important for your health. I mean, we all know this by now, so there's no need for a sunscreen soap box. 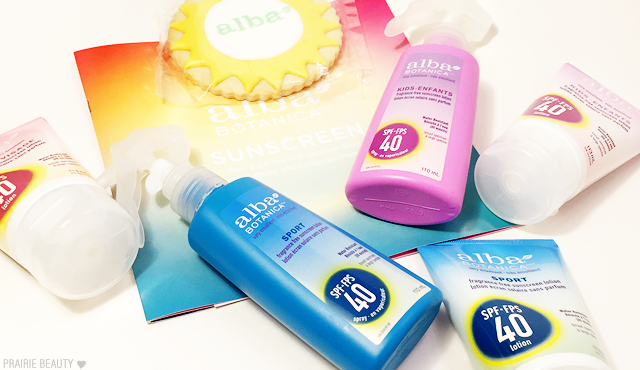 Instead, check out these sunscreens I've been trying out recently from Alba BOTANICA*! 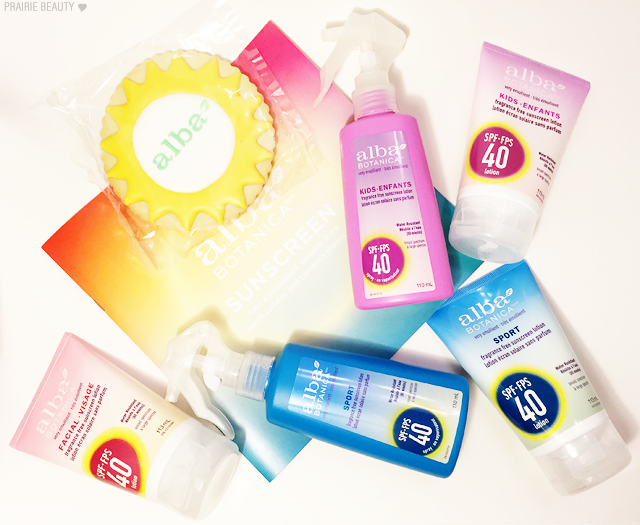 Alba's non-mineral sunscreens absorb and dissipate the sun's harmful rays in a glide-on formula that covers quickly and easily without residue. Our 100% vegetarian formulas are broad spectrum, offering both UVA and UVB protection with SPF 40. They're fragrance free, non-greasy, pH balanced, water resistant and, of course, dermatologist tested. Alba BOTANICA Sunscreen Lotion for Sport is everything you need to really enjoy your active, outdoor life. With SPF 40, our sweat-proof, water-resistant lotion goes on quickly and stays on, protecting and conditioning. I tested this one out roughly over this May Long Weekend with winter pale skin in the hot midday sun on a boat in a middle of a lake. Honestly, I don't think there's a situation in Canada that calls for more attention to SPF. This absolutely applied easily and left my skin look luminous, rather than even more pasty than when I began, and I reapplied after a few hours, and the results were exactly what I was looking for - no sunburn or irritation at all. My skin also didn't feel slimy or sticky, which can be a pet peeve for me, and I didn't feel like there was anything heavy left behind on my skin. I also shared this around with the friends and family that I was spending time on the boat with and everyone had really good experiences. Our fresh, kid-friendly SPF 40 sunscreen provides broad spectrum UVA/UVB protection. Its water resistant, non-greasy formula offers lasting protection for active kids. And it's fast absorbing, perfect for kids who can't stand still! Now clearly, I'm not a kid and I don't have any kids... But I feel like anyone could use this and get the same protection. One thing that I personally love is the spray lotion formula for kids, because it makes it a lot easier and quicker to just spray it on and rub it in. I also like using products that don't have harsh chemicals on children's skin especially, because I feel like they're more sensitive and I would hate to put something irritating on their skin. I really do think this is a great choice for families to pick up! It's gentle but so effective, providing broad spectrum UVA/UVB protection with SPF 40. Our fast absorbing sunscreen lotion for your face won't clog pores. And all our wonderful botanicals, like Aloe Vera, Ginseng, Lavendar and Calendula, hydrate and nourish delicate facial skin. I try to be really good about wearing SPF on the daily... but let's be honest, I'm a bit of a slacker on that. However, if I'm going to be spending time in the sun, I'm pretty determined to protect my skin. Unfortunately I've found that most sunscreens, even the ones that claim not to, ultimately break me out. So I was pretty amazed when this one absolutely didn't clog my pores. I feel like this applied nicely and didn't make me look overly greasy or shiny. I did have a little bit of makeup on underneath, and I found it wasn't really disruptive to that at all. Like with the Sport Sunscreen, I put this to the test in hot, midday sun reflected off the lake and it protected my skin beautifully. This is going to be a must have in my collection. 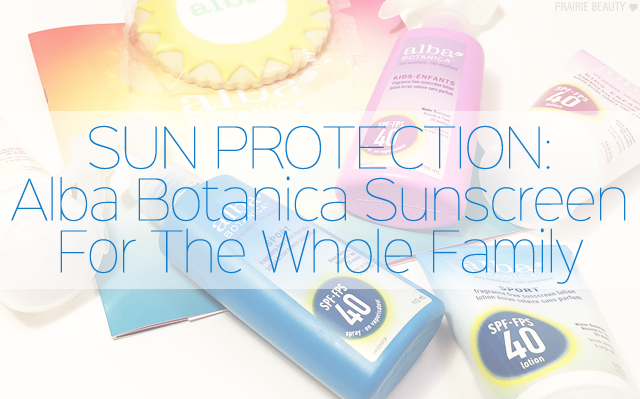 I really think these Alba BOTANICA Sunscreen options for the whole family are worth checking out. They have the spray lotion as well as the tube lotion, so you can choose whichever you prefer - my personal favorite is the spray lotion for the simple ease of it - and they do a really great job of protecting you from the sun head to toe. On a serious note, I really do feel like it's important to stress that everyone spending time in the sun should be wearing sunscreen. A tan looks great and all, but the sun is dangerous. Skin cancer is a concern for everyone, as it effects teenagers and young adults as well as older people, and is increasingly common in people 15-29. Regularly wearing sunscreen reduces your chances of developing skin cancer by up to 50%. So please, wear sunscreen and protect yourself and your family - and hey, look younger in the process!